As if RR didn't have enough to cope with, now it seems that Downing Street is considering nationalising the troubled firm's nuclear submarine business. 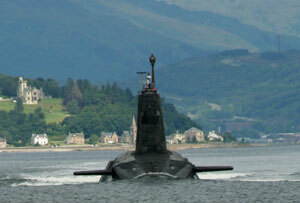 According to a leaked report from the Prime Minister’s office, various scenarios have been drawn up in case of serious bother at RR, which as well as being one of the UK’s few remaining world-class engineering outfits is also in charge of some pretty heavy duty defence assets – not lease amongst them the powerplants for the Trident nuclear submarine fleet. The official scenarios include not only nationalisation of the £500m annual revenue nuclear sub business, but also the possibility of a merger of all or part of RR with the country’s other remaining large defence contractor BAE Systems. The news – which comes after a string of profit warnings and bad strategic calls by Rolls-Royce – is hardly likely to do much to help new CEO Warren East get to grips with the firm’s issues. Indeed, given that RR has a huge 10 year order book and is still making a billion quid a year despite its problems, the powers that be could be accused of scaremongering. It’s fair enough that the government should consider these kind of issues in a private ‘just in case’ fashion, but making it public smacks of panic – especially as the story arrived conveniently only days after the City’s star investor Michael Woodford sold his 2.3% stake in RR for £232m. A cynic might say that his actions have rattled Whitehall into showing its hand in a potentially counterproductive way. But it is also true that if the firm’s share price continues to fall as it has – £10bn has been wiped off RR’s value in the past two years – then a takeover bid from a foreign rival can’t be rule out. The government has a golden share in RR so can block an approach – in theory anyway. In reality it would probably have to come up with a plan B – hence the idea of the BAE merger as a defensive response, presumably. There is no doubt that RR has got a lot of deep-rooted issues that need to be addressed pretty quickly – it’s becoming increasingly apparent that its management have made some serious wrong turns (getting out of the market for powering narrow body jets for example), and that problems which looked to be isolated in non-core divisions like marine power may have spread into the core aero engine business. But these are precisely the issues that Warren East was hired earlier this year to tackle, and all of us – shareholders, employees, the government and plain old UK citizens – should at least allow him the space to have a decent crack at doing so. Rolls-Royce is too precious a national asset to do otherwise.